Fresh Florida tomatoes are a delicious – and nutritious – addition to any meal. It’s easy to slice into some sunshine using the following collection of recipes. The following recipes were created by Chef Justin Timineri, Executive Chef and Culinary Ambassador for Florida Department of Agriculture and Consumer Services. 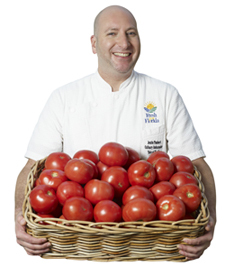 His philosophy on food is simple: “Cooking should always be fun, simple, and flavorful” – something that he achieves with Florida tomatoes.